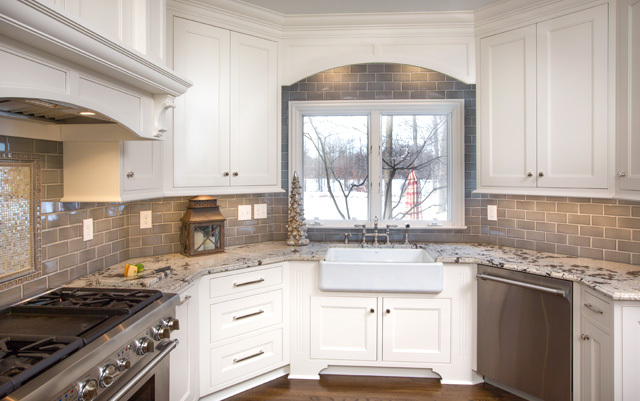 This beautiful kitchen located in Dublin, Ohio was designed for a busy household of five including three children. The owners not only wanted an updated look and design but something that the whole family could enjoy. It was very important to establish a space where they could enjoy meals together. With the blueprint created, an island was specifically constructed to portray a table like feel with seating on three sides. It’s functional purpose also bodes well in the morning, providing all three children a spot while mom serves breakfast. 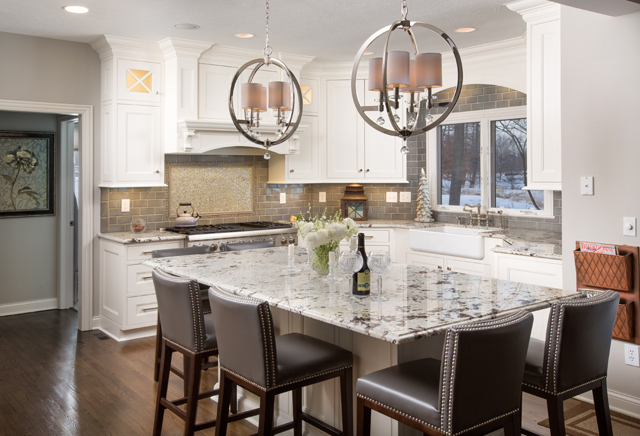 This elegant island was manufactured in one piece to give it a styled look. 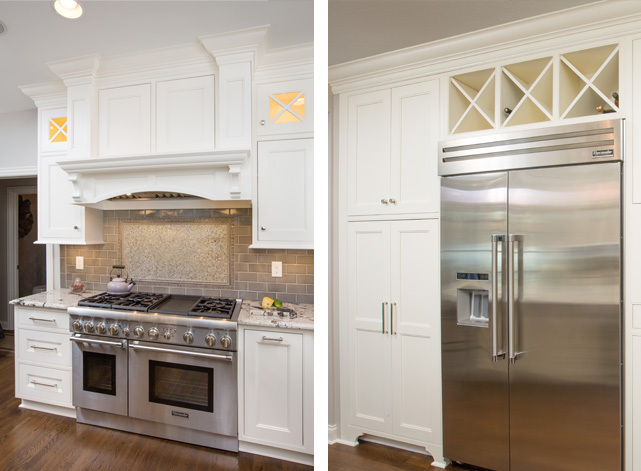 This kitchen design utilizes a flat beaded inset cabinet to give the appearance of high-end furniture. Top of the line Thermatron appliances were used, allowing for meals to be prepared more efficiently. A Miele coffee machine was built-in providing optimal space-saving qualities, while offering an excellent cup of coffee. There you have it, something for everyone! 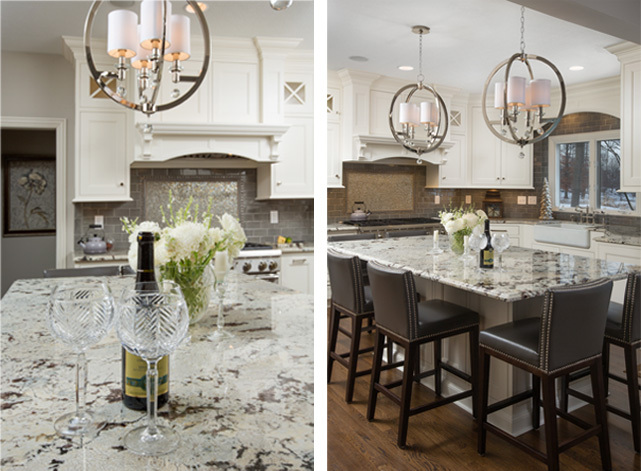 The chandelier shown is made by Maxim lighting and is part of their Montgomery collection. 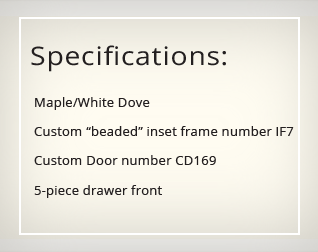 The model number is M24306CLPN and is available in polished nickel. The light was purchased through Fergusons Bath Kitchen and Lighting Gallery. The client chose vintage granite for the counters. The backsplash is a tile made by Sonoma called Rocky Crackle, which is a part of their Stellar Collection. The center of the mural is a Hirsch Glass Sparkle Palace mosaic. The mosaic is surrounded by Sonoma Tweed, which is known as an illusion border. This is included in their Tantrum collection. The Sonoma Rocky Crackle features a trendy bull nose, which surrounds the tweed illusion border. Lastly, beyond the bull nose is more of the Sonoma Tweed in a 1X1 mosaic tile. This is also from their Tantrum collection. Light Pewter grout was used on the Hirsch glass, while Delorian Gray grout is displayed everywhere else. The kitchen sink is made by Kohler. Here is a link to the model we purchased on the Kohler website. The faucet is part of the Rohl Country Kitchen Collection. The link does not show the faucet in polished nickel, but does give some good information.